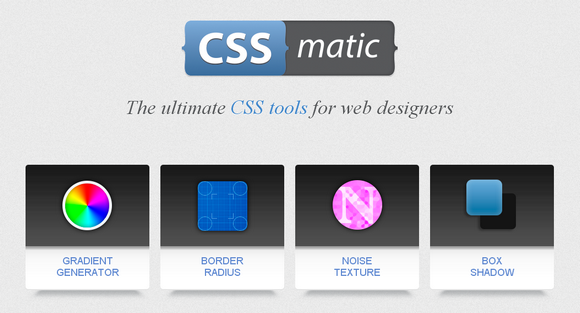 CSSmatic is a non-profit ultimate CSS tools for web designers. There are four useful tools at the moment. You can use the Gradient Generator which supports multiple colors and opacity stops to get amazing gradients. By using the gradient tool you can create gradients with smooth color changing effects and subtle transparencies. Border Radius is super easy to use and a super time saver. Change all the borders selected at the same time. Noise Texture helps you create subtle background patterns with dirty pixels and noise, changing the color and values and previewing the results in real time. Box Shadow supports Blur radius changes, color changes, shadow size. Everything that you need to create great drop shadows in a single place. One of the best I have ever seen. Awesome! Btw, really liked the gradient generator.